When Calls the Heart has reached four seasons and certainly each of them have their own different storylines but its core themes have always been the same. When Calls the Heart: Heart of the Community is no exception to that. Season 4 has brought new adventures and new difficulties for these characters to endure. One of the things that are always interesting for me to see when I watch whichever When Calls the Heart episode or movie DVD is seeing how these beloved characters tackle the curveballs that are thrown at them and it’s also great seeing how they’re doing, kind of like an update on their life. Several things are happening in When Calls the Heart: Heart of the Community. Hope Valley is preparing themselves for the arrival of the well-known railroad but it’s been creating some difficulties along the way. Ray Wyatt, who represents the railroad, is looking for a way to replace Elizabeth’s teaching position and find someone else. On the other hand, Elizabeth notices that school supplies are running low and there are not enough for her students so she intends to find a way to get new supplies for everybody. Rosemary gives Elizabeth the idea of a carnival fundraiser. Abigail, who’s now mayor, is having a difficult time finding a balance between what is best for the town and convenient business. Also, Jack and Bill are on the lookout for the unruly Tate brothers who broke out of jail and are causing trouble. By the beginning of the movie, Abigail is still negotiating with the railroad’s representative, Ray Wyatt. She has managed to stand her own but Wyatt still underestimates her because she’s a woman and thinks he can manage her easily, frankly to take advantage of that. But to Ray Wyatt’s surprise, Abigail is up to date with everything and knows the business. She makes a proposition of making a different route than the one that was originally stipulated and reluctantly Wyatt accepts but, of course, he has a condition. The condition would be that since he is the railroads representative he wants a tax exclusion. At this point indeed the railroad is considered to bring prosperity to the town of Hope Valley but it means a lot of work for Lee’s saw mill. Up till now, the employees have been working non-stop with continuous shifts and frankly, it’s stretching too thin. More workers with their families have been arriving in town due to work in the saw mill so as a result, Elizabeth’s classroom has never been so full. We meet little Philip Cantrell, the son of a saw mill employee who is constantly in continuous shifts. Other than noticing all the overworked employees from the mill, with so many children in her classroom Elizabeth also notices that her school supplies are running out. She needs to think of a way to help everyone. Also in When Calls the Heart: Heart of the Community, Rosemary has found work in Abigail’s Café but it’s really not her line of work. Often times getting distracted by other things. Rosemary gives Elizabeth the idea of doing a carnival fundraiser to help getting the money for more school supplies. The kids get raffle tickets and begin selling them as the event is planned. The carnival brings the families together, even Philip’s dad, Shane, joins in the fun as he and his son play some carnival games. The whole town comes together and manage different booths. The event is quite successful and Elizabeth manages to find what she needed to get new supplies. Jack and Bill hear about the Tate brother’s escape from jail and learn about their plan to rob the town’s bank, specifically important payroll. Jack, Bill and Frank create a trap to catch the men. 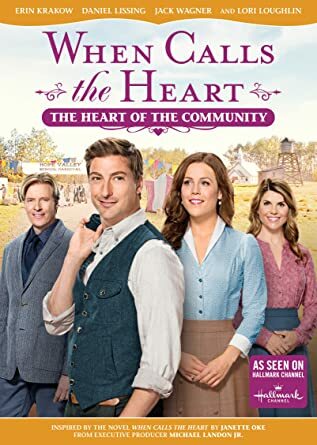 When Calls the Heart is indeed one of my all-time favorite series on television so if you’re looking for a family-friendly TV series to watch, you should check out this one. It is indeed a period piece and quite frankly is not something that is very common nowadays. You will not be disappointed. You can find season 1 through season 4 here in www.fishflix.com!